Background: The 'medial thigh lift' was first described by Lewis in 1957, but did not receive the widespread acceptance because of the various postoperative complications, such as scar migration with vulvar deformities and early recurrence of ptosis. For this reason, Lockwood developed a technique of anchoring the dermis to the Colles' fascia, to make the surgical outcome more stable over time and to prevent scar migration. In this article, we describe our approaches to the medial thigh lift in post-bariatric surgery patients. Materials and Methods: A total of 45 females underwent medial thigh reduction. In 15 patients with Grade 2 on Pittsburgh Scale (PS), we performed a thigh lift with a horizontal scar; in 15 patients with Grade 2 on PS, we used a technique with a vertical scar; in 15 patients with Grade 3 on PS, the above-mentioned two procedures were combined. When it was really necessary, we also did the liposuction of the medial thigh. The patients were observed every 6 months with a 60-month median follow-up (range: 12-108 months). Results: In six patients was observed scar enlargement due to poor wound healing (one patient with a horizontal scar, three patients with a vertical scar and two with the combined procedure). In two patients with a horizontal scar, minimal scar migration was observed. In three patients, the recurrence of ptosis was evident (one patient with a horizontal scar and two patients with the combined procedure). No skin necrosis was observed. 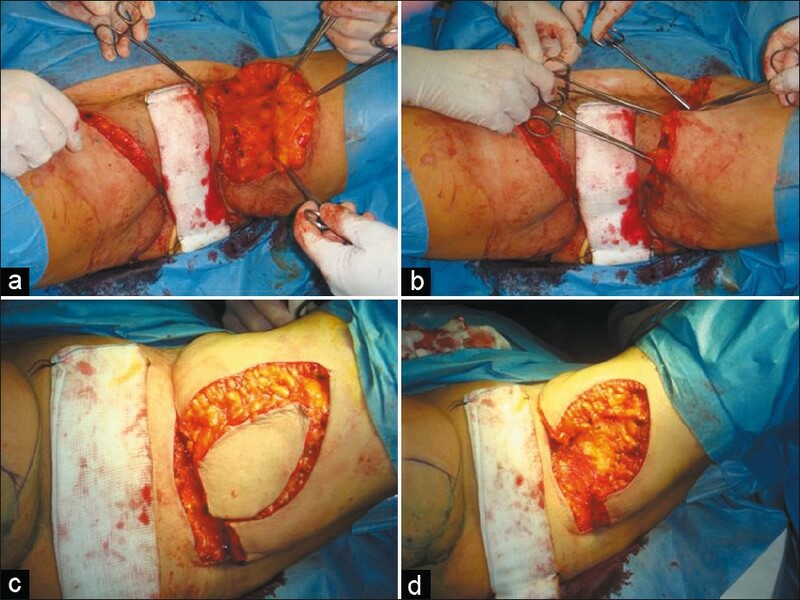 Conclusion: The medial thigh lift surgery is remarkably simple and free of major complications, if the basic anatomy of this region is understood, in order to preserve important structures such as the great saphenous vein and femoral vessels. The only complication is the presence of extensive and visible scars along the thigh, in the case of vertical procedure, and along the inguinal canal, with a possible distortion of the labia major, in the case of horizontal procedure. Massive weight loss (MWL) is defined as 50% or greater loss of the excess weight. The contour deformities after bariatric weight loss encompass diverse and unexpected manifestations that potentially involve every area of the body. After a rapid and massive weight loss, there is a sudden change in the body mass index (BMI) which leads to skin and soft tissue excess and poor skin tone. The skin and the soft tissues fail to retract completely and become redundant, collapsing inferiorly and infero-medially from the characteristic areas of fat deposition. In the lower trunk, the redundant tissues of the lower abdomen and the pubic area fall directly towards the inner thighs. There can be enormous overhanging pannus that disrupts the silhouette. The collapse of the redundant tissues from the lower abdomen, mons pubis, buttocks and also from the medial thigh itself contributes directly to the excess tissues along the thighs resulting in both a vertical and horizontal tissue excess. Striae are present throughout the torso. Moreover, women tend to have large amounts of cellulites as well, particularly along the hip region. Often there is pain, irritation and intertrigo under the massive skin folds. Historically, thigh reduction remains the most difficult to treat. The 'medial thigh lift' was first described by Lewis  in 1957, but did not receive the widespread acceptance because of the various postoperative complications, such as scar migration with vulvar deformities and early recurrence of ptosis. For this reason, Lockwood  developed a technique with anchoring the dermis to the Colles' fascia, to make the surgical outcome more stable over time and to prevent scar migration. In this article, we describe our approaches to the medial thigh lift in post-bariatric surgery patients. First, it is important to understand the normal anatomy and the structure of the thigh. Compared to other regions undergoing body contouring, the medial thigh has a relatively thin dermal component. Under the dermis, it is possible to distinguish two layers of adipose tissue, separated by a poorly defined superficial fascial layer. The deep layer of the superficial perineal fascia, as described by Lockwood, , is the connective tissue lying below the subcutaneous fat of the perineum. It attaches to the ischiopubic branch of the pelvic bone, while anteriorly it is contiguous over the pubic with Scarpa's fascia. Posteriorly, it fuses with the border of the urogenital diaphragm. At the junction of the perineum and medial thigh, Colles' fascia is thicker and it defines the perineal groove of the thigh. Then it is necessary to define the deformity characteristics. Generally, the patients with MWL have vertical tissue excess (thigh reduction). During the physical examination of the patient, it is necessary to evaluate different parameters: Quality of skin (degree and extent of possible laxity) and the soft tissue excess (amount and location). Once these factors are evaluated, the most appropriate surgical procedure is chosen. Moreover, it is important to examine and rule out deep vein problems. From June 2000 to June 2009, 45 female patients underwent medial thigh reduction (mean age: 48 years, range: 33-67 years). In 15 patients with Grade 2 on Pittsburgh Scale, we performed thigh lift with a horizontal scar [Figure 1]a-b; in 15 patients with Grade 2 on Pittsburgh Scale, we used a technique with a vertical scar [Figure 2]a-d; in 15 patients with Grade 3 on Pittsburgh Scale, these two procedures were combined [Figure 3]a-d. When it was really necessary, we also did the liposuction of the medial thigh. The patients were observed every 6 months with a 60-month median follow-up (range: 12-108 months). The skin-fat envelope of the thigh drapes over the underlying musculoskeletal core. It is less tightly adherent medially than antero-laterally. The entire thigh skin-fat envelope descends inferiorly in MWL patients. Although there is a certain degree of vertical excess, most of the excess is horizontal in these thighs. As the medial adherence is not strong, the tissues in this area descend the maximum giving the impression that it is vertical rather than horizontal excess. There occurs a medial vertical descent of the horizontal excess. Song et al. have designed an all inclusive and illustrative classification system that helps in systematically assessing and quantifying the level of deformities in each particular region. Ten anatomical areas delineated for analysis include arms, breasts, abdomen, flank, mons, back, buttocks, medial thigh, hips/lateral thighs and lower thighs/knees. Because of their complexity, face and neck regions have been excluded. A four-point grading scale was designed for each region: Grade 0, normal range; grade 1, mild deformity; grade 2, moderate deformity and grade 3, severe deformity. Generally, a mild deformity would require non-excisional or a minimally invasive procedure; a moderate one would need an excisional procedure while a severe deformity would require combinations of excision and lifting, and would involve large areas of undermining. The Pittsburgh rating facilitates the preoperative planning and is a useful tool in quantifying the improvement in appearance attributable to surgical manipulation. The extent and location of the horizontal and vertical soft tissue excess should be assessed. It is vital to rule out the pre-existing lymphoedema and deep vein thrombosis. Any evidence of lymphoedema or significant venous problems should be considered as contraindications for thighplasty. If horizontal excision is being incorporated, it is important to evaluate the degree of the traction transmitted across the perineal junction to the labia majora. The lateral traction thus exerted on the labia majora with a subsequent exposure of the labia minora has often led to medico-legal actions against the surgeons. The patient is placed in the lithotomy position in the operating room. The compressive elastic bandage of the leg from foot to knee is is made to improve venous return to prevent thrombo-embolic complications and against deep vein thrombis. A Foley catheter is placed. The patient is drawn in an upright position. The amount of skin to be removed is estimated, and the fat deposits, which in case have to be removed with liposuction, are marked. The upper incision line is drawn in the inguinal groove, with the anterior end that comes to the average femoral triangle and the posterior end that reaches the middle of the gluteal groove. Then the inferior line is made, based on the amount of skin to be removed as calculated by the pinch test, and an ellipse, which is usually between 4 and 6 cm, is drawn. The patient is placed on the operating table in a gynaecological position. We usually wrap the lower limbs, as a prevention measure for thrombo-embolic risk. The procedure starts with the proximal line incision, superficial dissection to preserve the superficial lymphatic network at the femoral triangle. We identify the fascia of Colles, which is anchored with non-absorbable sutures to the dermis of the upper and lower skin flap [Figure 4]a. This leads to less tension on the scar and more lasting results over time. Then we complete the planned suture of the subcutaneous tissue, sub-dermal tissue and skin with absorbable suture Monocryl® 2-0 and 4-0, to reduce tension on the scar [Figure 4]b. A semi-compressive dressing is then applied. We generally do not use drains, since the undermining of tissues is almost absent and the drainage in this area would be only a possible vehicle of infection. In this case, we determine with pinch test the amount of soft tissue excess and draw, down the medial aspect of the thigh starting on the perineal crease, an ellipse of the area to be removed. A vertical line, in the centre of this ellipse, corresponds to the scar and in some patients, the incision reaches the knee below the medial condyle. This area is aggressively liposuctioned to eliminate the fat without injuring the lymphatics and to visualize the excess skin. Occasionally, 'dog ears' could occur at the superior part of the wound; for this reason, it is necessary to extend the incision along the infra-buttock crease or anteriorly. As in the classic procedure, liposuction can be performed to remove fat deposits and thin the skin flap; in this case, the ellipse is repainted on the skin remaining after this process. Utmost care should be taken to preserve the lymphatic vessels and the great saphenous vein. A perfect haemostasis is a must along with the placement of a drain on each side, spiral drain type, in the most sloping zone of the thigh near the knee. All this is complemented by a layer suture as the above procedure, based on the use of Monocryl® 2-0 and 4-0, to reduce tension on the scar. Finally, we apply a semi-compressive bandage. The patient is placed on the operating table in a gynaecological position. The upper incision line is drawn in the inguinal groove, with the anterior end that comes to the average femoral triangle and the posterior end that reaches the middle of the gluteal groove. In addition, we determine with pinch test the amount of soft tissue excess. The lower incision line is in the middle of the ellipse of the area to be removed. A vertical line, in the centre of this ellipse, corresponds to the scar and in some patients, the incision reaches the knee below the medial condyle. All this is complemented by a layer suture as the above procedure. Finally, we apply a semi-compressive bandage [Figure 4]c and d.
We always use suction drainage, in the vertical procedure, while we use a Penrose drain in the horizontal procedure. In all patients, broad-spectrum antibiotic therapy is administered and thrombosis prophylaxis is implemented with the subcutaneous administration of enoxaparin sodium, leg wrapping and mobilization on the second postoperative day. We use a Dermatix gel in the case of a hypertrophic scar. The incidence of complications in our study was reduced by the appropriate management of co-morbid conditions before, during and after surgery, correction of anaemia and nutritional deficiencies, selection of the most suitable procedure for individual patients, precise markings, meticulous surgery, absolute haemostasis, three-point sutures to obliterate the dead space, meticulous multi-layered closure over drains, properly instituted postoperative care, supervised nursing and regular follow-up. The complications were minimal. The patients were observed every 6 months with a 60-month median follow up (range: 12-108 months). In six patients was observed scar enlargement due to poor wound healing (one patient with a horizontal scar, three patients with a vertical scar and two patients with the combined procedure). In two patients with a horizontal scar, minimal scar migration was observed. In three patients, the recurrence of ptosis was evident (one patient with the horizontal scar and two patients with the combined procedure). No skin necrosis was seen. Lymphoedematous changes were not observed in any of the patients. Skin laxity of the medial thigh is both an aesthetic and a functional problem. Normally, it occurs between 35 and 45 years of age. The deformity of the medial thigh is extremely variable and much more frequent in the female patients, who have a genetic tendency to a 'pear' configuration. In some patients with skin laxity but without remaining lipodystrophy, we proceed to surgical excision. However, in patients with skin laxity and localized fat deposits, we proceed with liposuction and surgical excision, with a horizontal or vertical scar, often within the same surgery time. Many studies on the use of laser-assisted liposuction are available; according to some of these studies, such as one by Woodhall et al.,  laser-assisted lipolysis has been suggested to augment traditional liposculpture by improving skin laxity and providing haemostasis. In this paper, three separate pilot studies were performed. In the first study, both arms were treated with tumescent liposculpture. One arm was randomized to treatment with a subcutaneous 1064-nm Nd: YAG laser. The second study treated multiple sites with half of the area randomized to receive the 1064-nm versus the 1320-nm system followed by aspiration at equal power. The third study treated patients using a combined 1064/1320-nm multiplex laser system at multiple sites. The endpoint of laser treatment was determined by an external skin surface temperature of 40°C. In the first study, no significant improvement over tumescent liposculpture alone was noted using the 10-W, 1064-nm laser. The second study showed no difference using the 10-W, 1320-nm versus the 10-W, 1064-nm laser-assisted lipolysis system. Finally, the multiplex 1064/1320-nm system appeared to show improvement in skin laxity and fat reduction. Complications included intra-operative thermal burns in 2 of 20 patients using the multiplex system. No complications were noted using the 1064- or 1320-nm, 10-W systems. Woodhall et al. suggested that laser-assisted lipolysis provides an innovative way to address the problem of skin laxity and fat reduction. Clinical results increased dramatically with the combined 1064/1320-nm multiplex system. However, caution should be used when exceeding external skin temperatures of 40°C to avoid unwanted thermal burns. Another work of Kim et al. suggested the safety and efficacy of a 1064-nm Nd: YAG laser with a 300-mm fibre for the reduction of small unwanted fat areas. The authors deem appropriate in some cases this technique for the treatment of small localized fat deposits, but have not found any kind of benefit in the treatment of patients in the study. The awareness that obesity is a chronic illness has led an increasing number of people to lose weight, rather with drastic diets than with the use of bariatric surgery. This has created a new type of people who turn to plastic surgeon: A lot of patients who have undergone MWL find themselves with laxity and redundancy of skin and fat deposit residues in different parts of the body. One of these is the inner thighs. The medial thigh lift should be taken into account when the skin and redundant subcutaneous tissue cause skin diseases, and difficulties in personal hygiene, physical exercise and daily life. The medial thigh lift was first described by Lewis  more than 30 years ago, but many techniques have been developed since then. However, this procedure never achieved widespread acceptance because of some complications such as vulvar distortion, vascular and lymphatic alterations and early recurrence of ptosis. To reduce these complications, Lockwood , introduced the technique of superficial suspension of the fascia, which consists in anchoring the dermis to Colles' fascia. However, this technique is usable exclusively in the horizontal procedure. Other than the common complications of infection, seroma, bad scarring and hematoma, and wound separation are extremely frequent with edema of varying degrees, after vertical thigh reduction. A visible scar along with possibly distorted labia major is common after the horizontal procedure. In order to reduce these complications, we limit subcutaneous undermining and avoid operating the femoral triangle area. Also we do not put any tension on the labia major. Associated with this type of surgery we cite, besides those already mentioned in the case of a transverse process (migration and displacement of the scar of the labia major), the possible damage to vascular, and especially lymphatic, structures. During the medial thigh lift, the resection of the hypodermis causes the destruction of the lymphatic collectors, with the risk of a persistent edema. This complication can be avoided by leaving a thin layer of hypodermis, covering the fascia that contains lymphatic vessels. In addition, we use the technique of incision of the only dermis up to the subcutaneous tissue, and then execute a real 'stripping' of the dermal skin flap which has to be removed, leaving intact the lymphatic vascular structures. In addition, the risk of thrombosis in MWL patients undergoing body contouring is high because of the extended operation time, the size of the wound area and the potential fat trauma. Contributing risk factors are use of oral contraceptives, pregnancy, advanced age, recent surgery, coagulopathies and prolonged immobilization. In our study we include thrombosis prophylaxis with the use of intra-operative compression treatment of lower legs, low-molecular-weight heparin, circulation-promoting measures such as infusions of 2-3 l of RL for dilution of circulating blood, postoperative beach chair position, early mobilization, etc. Intermittent compression pumps may also be used as an alternative to compression stockings. The medial thigh lift surgery is remarkably simple and free of major complications, if the basic anatomy of this region is understood, in order to preserve important structures such as the great saphenous vein and femoral vessels. The only complication is the presence of extensive and visible scars along the thigh, in the case of vertical procedure, and along the inguinal canal, with a possible distortion of the labia major, in the case of a horizontal procedure. MWL patients are often quite willing to tolerate this type of scars in order to solve the problem. The success of the medial thigh lift is determined by a careful preoperative analysis followed by an adequate surgical plan. Therefore, this surgery should be reserved for the patient with a real need for it, with skin laxity and/or residual lipodystrophy, always informing him or her about the visibility of any scar. 1. Shrivastava P, Aggarwal A, Khazanchi RK. Body contouring in a massive weight loss patient: An overview. Indian J Plast Surg 2008;41 (Suppl):S114-29. 2. Lewis JR. Correction of ptosis of the thighs: The thigh lift. Plast Reconstr Surg 1966;37:494-8. 3. Mathes DW, Kenkel JM. Current concepts in medial thighplasty. Clin Plast Surg 2008;35:151-63. 4. Lockwood TE. Fascial anchoring technique in medial thigh lifts. Plast Reconstr Surg 1988;82:299-304. 5. Moreno CH, Neto HJ, Junior AH, Malheiros CA. Thighplasty after bariatric surgery: Evaluation of lymphatic drainage in lower extremities. Obes Surg 2008;18:1160-4. 6. Lewis JR. The thigh lift. J Internat Coll Surgeons 1957;27:330. 7. Lockwood TE. Lower body lift with superficial fascial system suspension. Plast Reconstr Surg 1993;92:1112-22; discussion 1123-5. 8. Song AY, Jean RD, Hurwitz DJ, Fernstrom MH, Scott JA, Rubin JP. A classification of contour deformities after bariatric weight loss: The Pittsburgh rating scale. Plast Reconstr Surg 2005;116:1535-44; discussion 1545-6. 9. Woodhall KE, Saluja R, Khoury J, Goldman MP. A comparison of three separate clinical studies evaluating the safety and efficacy of laser-assisted lipolysis using 1,064, 1,320 nm, and a combined 1,064/1,320 nm multiplex device. Lasers Surg Med 2009;41:774-8. 10. Karen KH, Geronemus RG. Laser Lipolysis Using a Novel 1,064 nm Nd: YAG Laser. Dermatol Surg 2006;32:241-8; discussion 247. 11. Shermak MA, Mallalieu J, Chang D. Does thighplasty for upper tigh laxity after massive weight loss a vertical incision? Aesthet Surg J 2009;29:513-22. 12. Wolf AM, Kuhlmann HW. Reconstructive procedures after massive weight loss. Obes Surg 2006;17:355-60. 13. Kenkel JM, Eaves FF. Medial thigh lift. Plast Reconstr Surg 2008;122:621-2. 14. Le Louarn C, Pascal JF. The concentric medial thigh lift. Aesthetic Plast Surg 2004;28:20-3. 1 Medial Thighplasty After Massive Weight Loss: Are There Any Risk Factors for Postoperative Complications?